Many homeowners are looking for ways to open up space in their home. Instead of a closed-off environment, more and more people are choosing an open floor plan that makes the home feel more spacious. 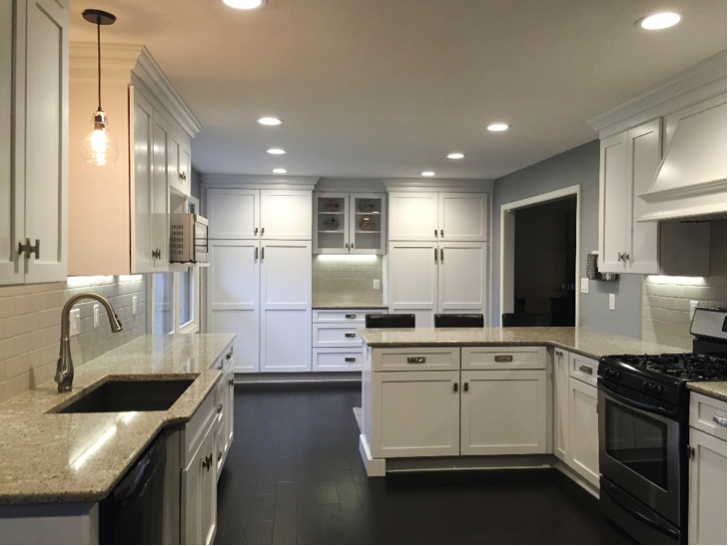 In a recent kitchen remodel, we were able to do this exact thing for our client. We took a closed off kitchen with dark décor, and transformed it into a brighter and more open space. Let’s take a look at some of the details. Probably the biggest change that we made was removing a non-load bearing wall that separated the kitchen from the pantry area. Taking out this wall (and the heavy, dark brick) makes the space much more open, and makes the kitchen feel so much larger! The whole space flows, which really creates a welcoming environment. Another change we made was to the cabinets and countertops. We kept the white color, but put in new, more modern, semi-custom cabinets. A new gray countertop adds just a touch of contrast, while still keeping things light. The backsplash was also updated, using matte gray subway tile. We chose a matte finish because it kept the space clean and bright without adding too much shine. 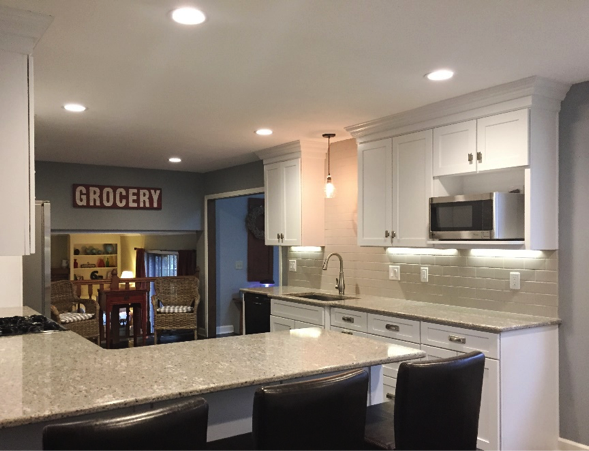 The kitchen needed more light, so we added recessed lighting to ceiling, to keep the open feel. 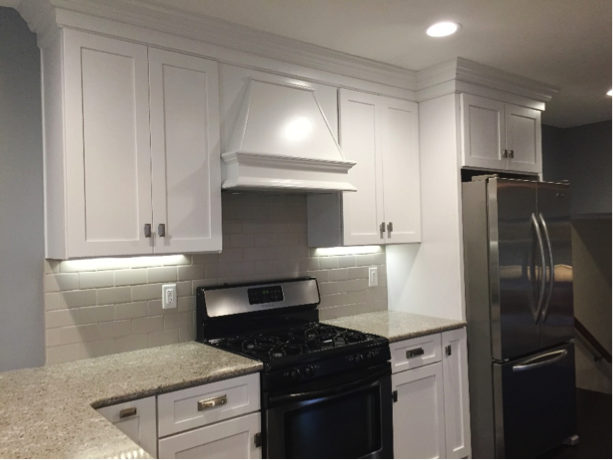 In addition to these lights, we also added dimmable LED accent lighting under the cabinets. This allows the homeowners to accent the backsplash, or provide mild lighting for night time. We kept things simple on the floor, with a dark hardwood that blends nicely with the flooring in other areas of the house. The final result of all these changes is a bright space that is open and inviting. 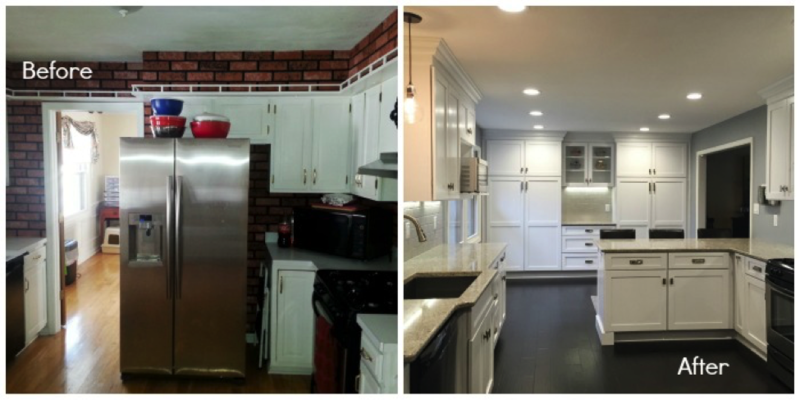 We’re very pleased with this transformation, and we’d love to do the same in your home. 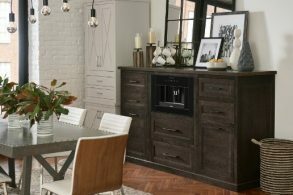 If you have a space that you would like to open up, contact us with your questions, or stop by our showroom. With a few simple changes, we can take your dark and closed space, and make it something open and bright. Looking for more inspiration? Check out past projects in our Project Gallery.